The main objective of the training was to prepare trainers among volunteers of community media, as well as to create conditions in the follow-up activities for community media development. During the training, participants learned methods of conducting trainings, technique of building teams, the conducting group and individual works. Participants acquired skills on developing program of the trainings, on selection exercises and examples for the training. In addition, participants had an opportunity to conduct session in small groups as a trainer. "I conducted training in a small group. It is a first time as I see myself as a coach. It was a good experience for me. Of course, I do not have enough experience, but I am ready to work, to correct mistakes and to teach our new volunteers for creation news reports, interviews and publish them on the website"- says Aisuluu Erkinbekova volunteer of Community multimedia center of the village Oogan-Talaa in Jalal-Abad region. 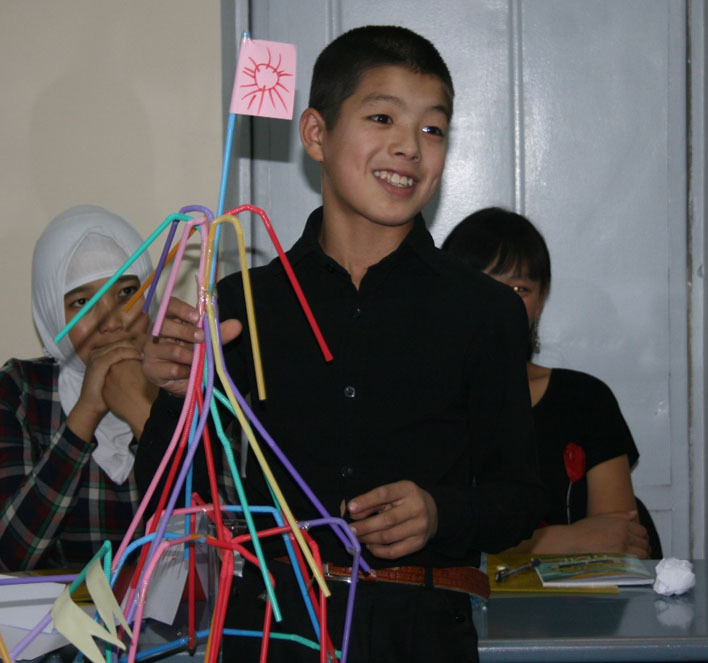 In this training, I was very impressed by the leadership quality of our youngest participant, pupil of seventh form, Kubanichbek uluu Azamat. If these kind of people will teach and lead volunteers, our community media will be developed. Mr. Atabek Aripov volunteer from village of Uch-Korgon, Osh region. For young activists were prepared sessions of conducting trainings on creation news, interviews, on way selecting training participants, on using mobile technology in journalism. 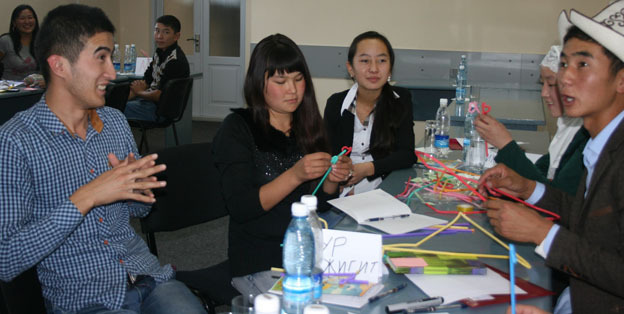 “In this training, I was very impressed by the leadership quality of our youngest participant, pupil of seventh form, Kubanichbek uluu Azamat. If these kind of people will teach and lead volunteers, our community media really will develop” - says Atabek Aripov volunteer from village of Uch-Korgon, Osh region. At the end of the training, participants received a package of documents in electronic format, necessary for conducting trainings for community media on creating content for the site, on using mobile technology for publishing, Each participant will conduct 3 trainings within 6 months. 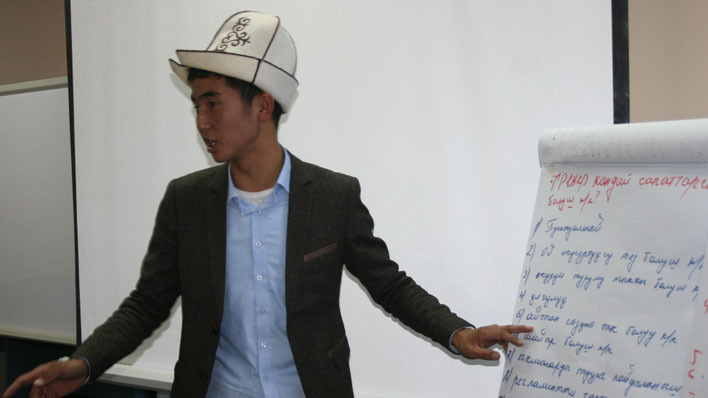 Training of trainers organized by Media Workers’ Union of the Kyrgyz Republic, with the support of the UNESCO Cluster Office in Almaty. The Joint EU-UN project “Operationalizing Good Governance for Social Justice”, was launched in October 2011 and will continue during 36 months till October 2014. The goal of the project is to boost the realization of the civil right to public services, especially for vulnerable groups of people - women, youth and children of 30 villages in 7 provinces of Kyrgyzstan. UNDP, UNICEF, UN-Women and UNESCO support this project. The European Union provides financial support of this project together with the above-mentioned UN agencies.